The Poplar Hawk-moth spends most of its time well masked on a tree branch. At dusk, this moth goes feeding and searching for a mating partner. These bugs are widespread all over Eurasia, from Ireland and Great Britain through all parts of Europe to the Eastern parts of China. Sometimes called the Sphinx-moth because the caterpillars sometimes take the “Sphinx position”. These moths are nocturnal. During the day they usually rest on a tree or a fence. They mostly live in farmlands, preferring humid climate – river shores, deciduous forests and irrigated territories. While resting, the Hawk-moth looks like a dry leaf and they’re almost impossible to spot. At night they become active and start looking for a mating partner to lay eggs as soon as possible. 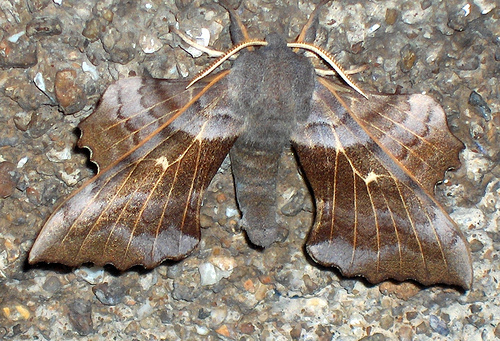 First Hawk-moths start flying in May and June and they soon start mating and laying eggs directly on tree leaves. Seven days later bright green or blue caterpillars hatch. Throughout its development it undergoes five phases, during which the skin is changed four times. When the caterpillar has obtained enough fat (usually in September), it climbs down from the tree, digs a small hole and becomes a pupa and later on transforms into a moth. 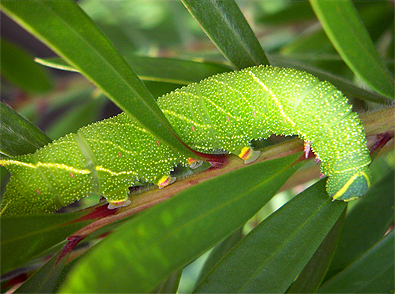 Poplar Hawk-moth caterpillars feed on tree leaves on which they hatch. 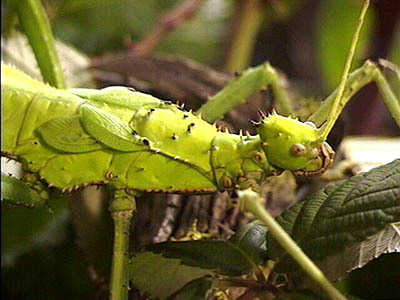 They are extremely gluttonous and eats multiple leaves per day. Mature moths act differently – they eat very little, their diet consists mostly of nectar and most of their energy comes from the fat stored while they were in the caterpillar form. Most of the Poplar Hawk-moths live for a very short time, because their sole purpose is to mate and lay eggs for new caterpillars to hatch from next year. All moths can be proud of their camouflage. Poplar Hawk-moths are almost impossible to tell apart from tree bark. 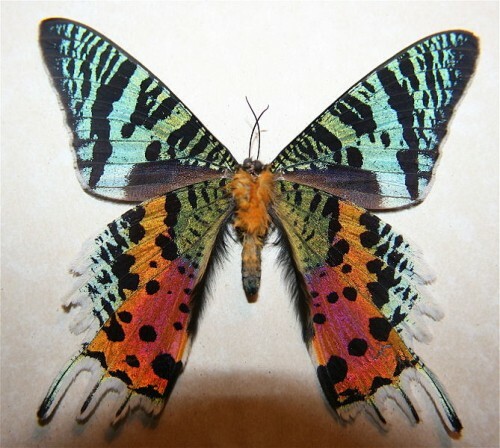 They also have a special form of defense – if the moth is spotted and somehow aroused, it will open its wings, showing red dots on the underwings, which often makes creatures think the moth is venomous. The caterpillars are also incredibly cunning – if attacked, they raise their heads and bloat, becoming much bigger and looking almost like a snake. Imitating other species is called mimicry and Hawk-moths are especially keen on using this technique – they often give the impression that they’re a different, much more dangerous creature that should better be left alone. Just like other moth species, the Poplar Hawk-moth is directly affected by the destruction of their natural habitat, especially the populations that live in tropical regions. Although they’re not currently endangered, the population is on a decline, because every year there are less and less proper places to lay eggs, and often trees with moth eggs are cut down before they can hatch. very in depth article, i found one in Connecticut in my garden and was surprised, i tried researching the natural wildlife cause i never seen anything like this before and found that they are definitely not any american species of moths. I don’t know how it got here but thanks for the article it really helpful in learning about them! i JUST found one of these on the sidewalk. my dog tried to eat it, fearing it was poisonous i took the dog in the house and went to gather the caterpillar to see what type it was.. now knowing what it is i wish i had made a cage for it to change, as they are very pretty. after reading this i see now why it was on the ground. i unknowingly put it back in the tree. it was maybe 3 inches long and as wide as my hand. about the thickness of my middle finger. if they are not from around here i wonder how it got to Kentucky.